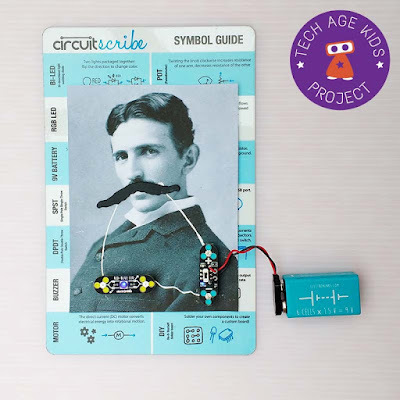 Do you want to make a Nikola Tesla picture that lights up when you add his moustache? 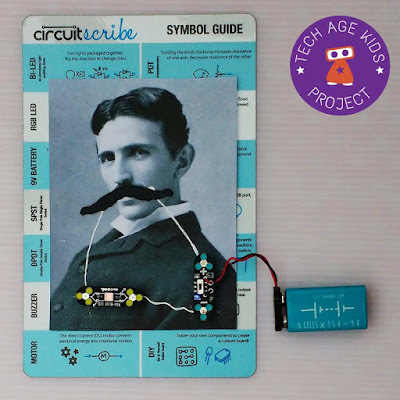 We couldn't resist combining the gentlemen's accessory fridge magnets that my 8 year old got for his birthday with the magnetic Circuit Scribe electronics kit that we have been trying out. 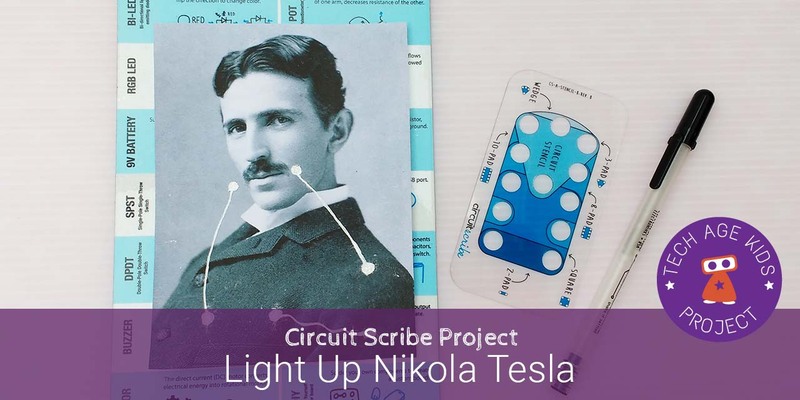 Disclosure: Electroninks provided us with a Circuit Scribe Kit for review. Our opinions are our own. Here's the finished project. The light on Tesla's badge (pin) goes on when you add the magnetic moustache to this picture! Tesla is commonly pictured with a dark moustache. We used an image from Wikimedia Commons as the basis for this project and scaled it down to 50%. 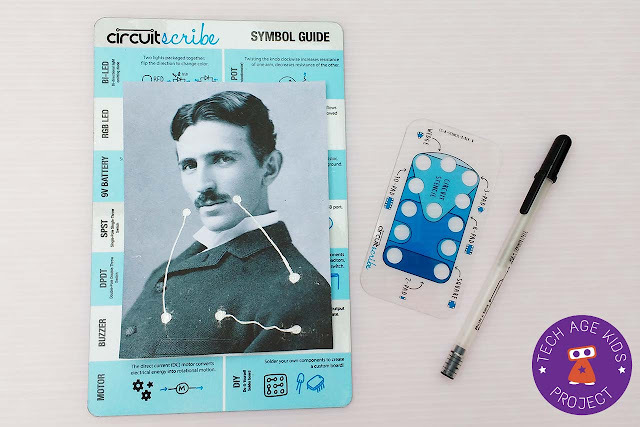 Circuit Scribe electronics combines magnetic components with an electronic ink pen. You just draw the wires in your circuit, place it on a steel board and then pop the magnetic components on top. We chose a Circuit Scribe led as the output, it's red when connected in one direction and blue in the other, so you can choose which you would prefer or swap it around as another interactive feature. 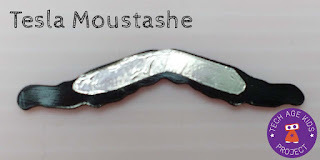 In our circuit the moustache acts as a switch. 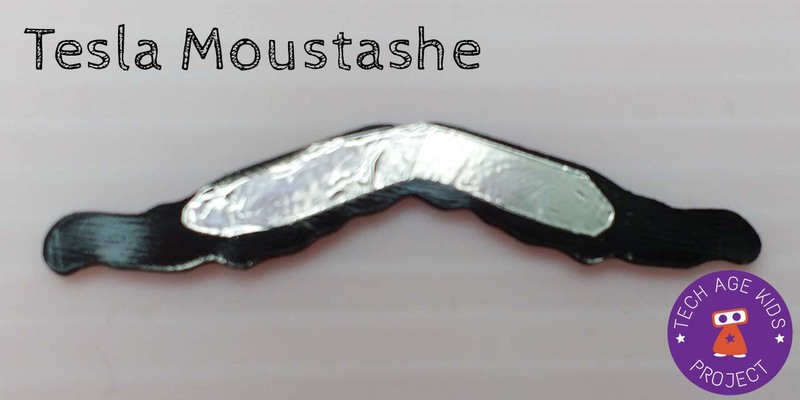 We took a fridge magnet and added a piece of aluminium tape on the back to make it conductive. We used the Circuit Scribe stencil to draw blobs of electronic ink where the components connect and then drew wires. We added blobs of electronic ink where the moustache goes so that putting it in place lights up the LED. That was fun. I think we'll have to give this treatment to some more famous technologists. Subscribe to find out about future projects in this series. Circuit Scribe kits are available to buy on Amazon. You'll be able to complete this project with a small kit, but future projects in this series will require components that are only available in the larger kits.